Ever since it debuted on January 2019, the variety show Qing Chun You Ni (“Youth with You”) has attracted widespread attention from audiences all around the world. 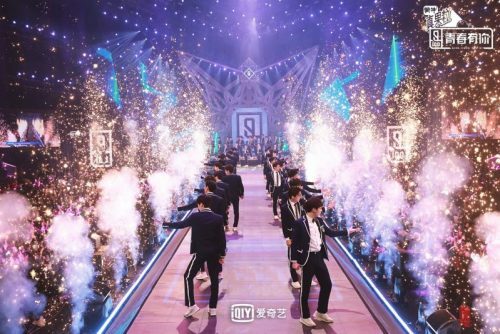 April 16, 2019 — Ever since it debuted on January 2019, the variety show Qing Chun You Ni (“Youth with You”) has attracted widespread attention from audiences all around the world. Overseas fans from the United States, South Korea, Japan, Brazil, Thailand, Singapore, Argentina, Malaysia, Italy and many other countries, making up over 130 fan groups, follow the show closely and have impressively spurred global trends. The followers of Qing Chun You Ni’s overseas social media account have been increasing rapidly, creating a large amount of discussion on the topic around global networks. How did this show become a global trend? The high-standard the show has for its trainees is definitely the factor that’s most attractive to audiences. As a show that aims to have trainees prepared for the stage, it emphasizes the concept of “Chance favors the prepared mind” from the very beginning to set the tone of the show and focuses on skill training rather than emphasizing the trainees’ emotional developments throughout. When expectations are not fully met, trainees would be directly questioned if they have tried their best and be pushed to train harder. The high-standard which was set by professional judges from the industry rises the show’s credibility with valuable contents. Qing Chun You Ni also puts great emphasis on the integration of art and morality, making it an important part of the trainees’ training by making community services a criteria of assessment. The show avoids gaining public attention through dramatization. Instead it focuses on the trainees’ growth as they become more equipped for high-quality performances, making the show stand out from all the other variety shows. Qing Chun You Ni has received an overwhelming amount of positive comments from viewers, including “This show enriches the future potential of Chinese music”, “China needs such a program to show the positive outlook of its young people”, and “The production concept, stage art design, and music selection really shows how much Chinese performers and variety shows have developed”. Although the language of the show could be a barrier to overseas audiences, the wonderful stage performances and talent of the trainees from Qing Chun You Ni have surely captivated global attention, capturing the show’s core idea of “The harder you work, the brighter you’ll shine.” As a result, Qing Chun You Ni is now trending globally and will surely be making a huge impact in the international music scene!